Here's a little story I received. But is it a coincidence? Seems unlikely to the logical mind, but who knows. But whatever, it's a mystery. 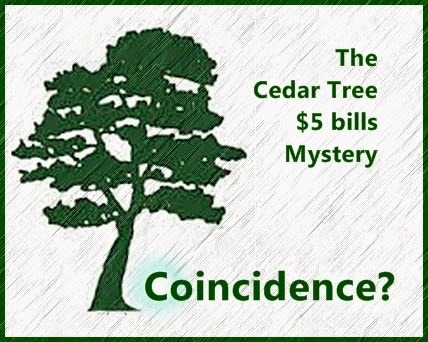 "We were out weeding our garden and watering the lawn when what should we see but a five dollar bill under one of our twin cedar trees. We put it aside thinking perhaps some recent guest had dropped it. Then next morning when we went outside to see how our rose bushes were doing, in exactly the same place, under a cedar tree, was another five dollar bill. My husband lapsed into a corny joke and called out, "See der money!" as he stooped to pick up the green stuff from under our cedar tree. But there is still more to this 'coincidence' because the next day, Tuesday, and then Wednesday and Thursday we picked up a $5 bill each day off our lawn. And then on Friday ... nothing! And no more since. We are mystified as to where the $25 in total came from. Coincidence? Magic? A joke?"